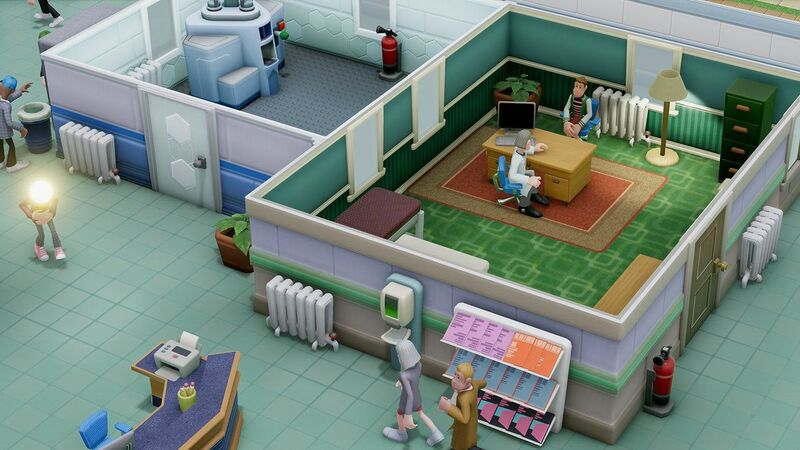 Now I had a steam voucher for my birthday and also a steam sale always seems to manage to tempt me, I was drawn towards Two Point Hospital, and I have to say I am not disappointed. It’s really very charming and funny, then after a while, I was pleasantly surprised to find how addictive it can be. The readable, disarming art style and chuckle-worthy fictional diseases such bed face and jazz hands. 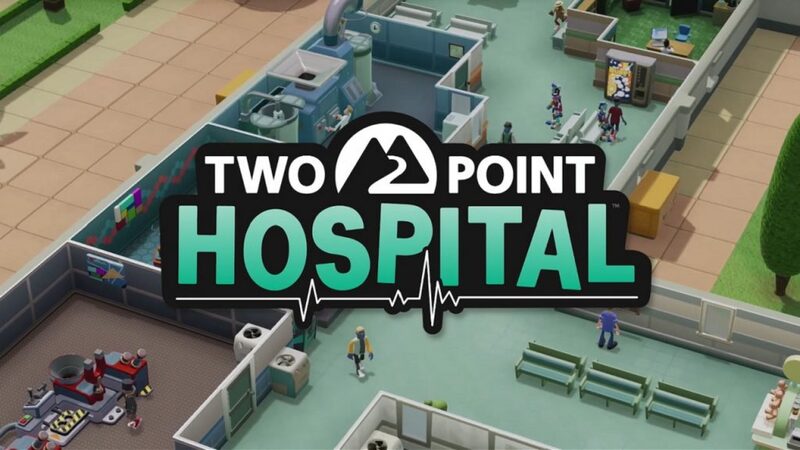 There are a total of 15 hospitals you’re asked to manage across the Two Point County, they all offer different objectives and challenges to overcome, lending a welcome variety to the routine of diagnosing and curing patients to increase reputation and turn a profit. The layout of a facility has a large impact on the problem-solving and crucial to the game. It’s crucial to fit in diagnostic facilities, wards for long-term care, employee amenities, and specialists required to treat some of the wackier and more severe ailments. Furthermore, there needs to be enough space left over for patients and its staff to navigate between these hotspots. It’s a system that requires plenty of planning and rewards clever use of space. The patients and staff will have a better time in an environment with plenty of plants, artwork, food and drink options, and entertainment to pass the time like televisions and magazine stands. You need to be able to providing comfort in each room in your building, as it carries a prestige rating based on the decorations and other extras you add to it. The best doctors aren’t going to apply to come work in an office that looks like a prison cell with a desk, so making sure everything looks nice is key to improving your roster of medical professionals. The hiring and training staff with an eye toward how their proficiencies and personality traits will affect their job performance is another ongoing challenge with highs and lows. It builds up the personality of your staff and adds relatable – though sometimes absurd – human drama to the mix, such as you may end up with character Gregory House who is a superstar at diagnosing tricky illnesses, but doesn’t get along with his coworkers and has no bedside. Is he worth hiring over a general practitioner with a heart of gold who doesn’t know the measles from the common cold? There’s often no single right answer to these kinds of conundrums there are so mant pros and cons of all tour staff, which grants you some freedom in what you want do and what you want to prioritise in your hospital and how you want it run. Staff training provides an ongoing way to keep improving the efficiency of your hospital. At the beginning, you can drop a lot of money into bringing in outside consultants with high-level skills to train staff. Once you have a good stable of practitioners built up in your hospital, you can use the hot-shots to train the newbies. which is great. Furthermore, it’s even possible to have doctors on staff who primarily deal with training and only treat patients in a pinch as you pick the jobs that you doctors and nurses do so they aren’t all doing the same task, which further expands on the interesting considerations involved in perfecting a roster. 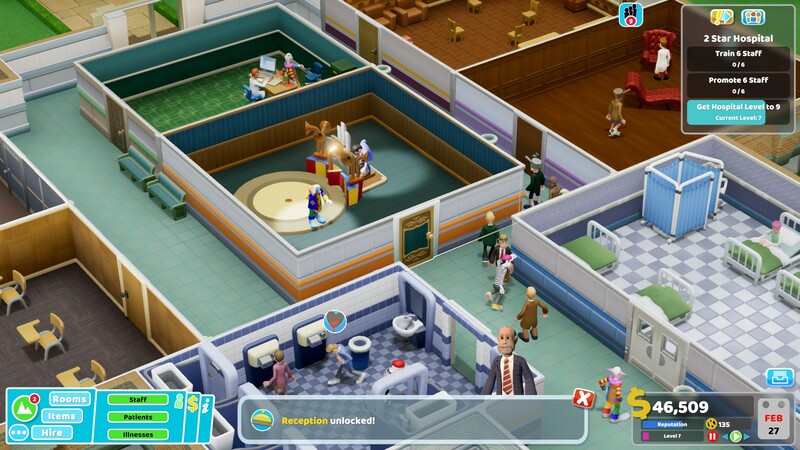 This combined with progressively harder objectives to earn one to three stars on each hospital and periodic emergencies like epidemics or contagious outbreaks that require manually administering vaccinations by spotting and clicking on the afflicted, Two Point Hospital always felt like it left me with something tangible to work toward, and its highly addictive with how much can you change and shape how your hospital is run and what patients to take on. The parade of unwell patients that come and go, provides quite a bit of genuine amusement purely from the comical nature of their ailments. A poor soul will come in with a case of “Lightheadedness” – literally having a lightbulb for a head – requiring the offending appliance to be unscrewed and replaced with a new, 3D-printed human head. A lot of character and attention to detail went into the animations. Each of the hospital’s have a unique set of concerns that help keep things from getting too stale and keep it very interesting. Some areas of the county require heating or air conditioning units to keep the temperature at a comfortable level for staff and patients, which makes you rethink how you are going to layout your rooms and corridors. One level, set at a university, gives you only inexperienced applicants for all staff positions, forcing you to make use of the training classroom and build up a teaching hospital. Some gimmicks work better than others, though. 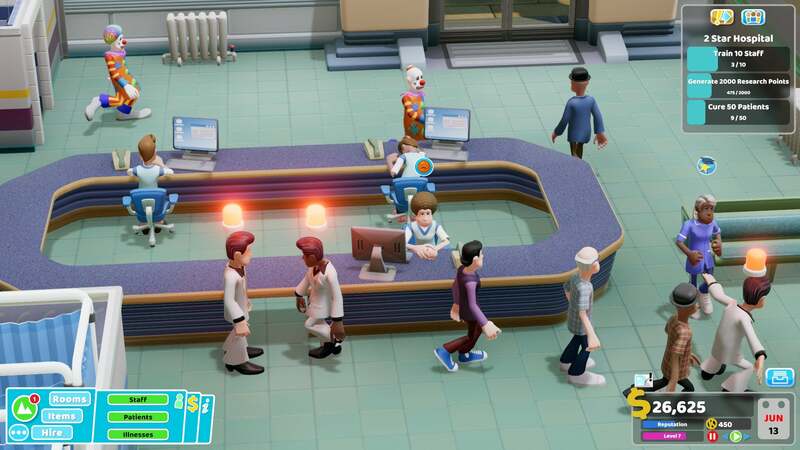 I am having such as great time Two Point Hospital, as I think it does such a good job of making you aware of potentially non-obvious problems and actually offering advice on how to fix them so your not just clicking random buttons or get in a state of panic no knowing what to do. If there’s some breakdown in the supply chain of admission, diagnosis, treatment, and discharge, large, readable icons really help you pinpoint exactly where the bottleneck is. Pop-up hints continually remind you of things you may be neglecting, which I think is great and really helpful in this type of game, were you can easily get lost in this type of game and the pop ups really help to keep you focused. But one thing I would say is actually think about your layout of rooms as its key in someways to keeping patients and staff happy. 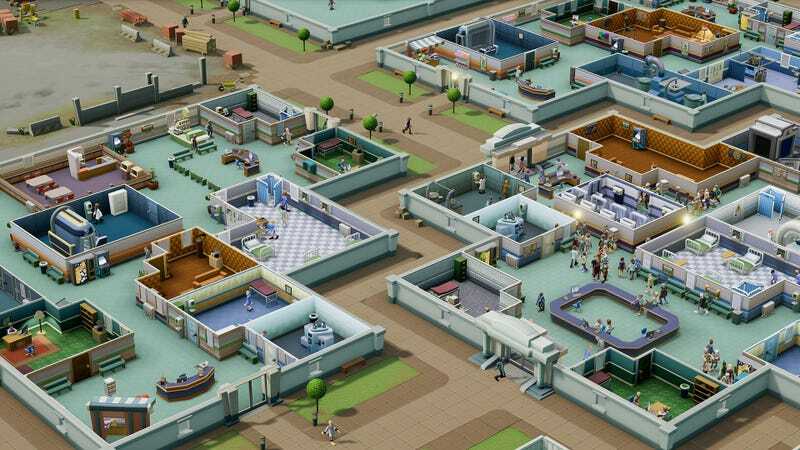 Two Point Hospital, I feel really revitalises the business management genre with flair, character, and enthusiasm with is quirky cartoon style graphics. It has easily understandable tips and icons make it relatively stress-free to get a working urgent care centre running smoothly. The potential for deep optimisation through tweaking building layout and making wise hiring and training decisions leave plenty to munch on for the micromanagement lovers among us. I am really enjoying this game and I haven’t played like this since Zoo Tycoon which I loved, but I feel this adds more to the genre and great experience where it challenging without causing too many rage quits. Its had great depth and humour to keep it going. Posted in games.Tagged game, images, insight, PC, review, steam, twopoint, twopointhosptial. Next Post Resident Evil 2: Remake completion review!